CST is a gentle, non-invasive method of evaluating and enhancing the function of the CranioSacral system, which maintains the environment in which the central nervous system functions. Developed by John E. Upledger, D.O., O.M.M., this manual therapy encourages the body’s natural healing mechanisms to improve the operation of the central nervous system. It helps dissipate the negative effects of stresses and strains absorbed by body, enhance health and strengthen resistance to disease. Like the pulse of the Cardiovascular system, the CranioSacral system has a rhythm that can be felt throughout the body. 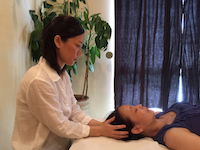 Trained therapists are able to palpate the motion of the CranioSacral system with roughly five grams of pressure to evaluate the internal environment. Problems within the CranioSacral system can be detected by monitoring the qualities of this rhythm and determining the locations of restricted motion. Headaches, Neck and back Pain, Sleep disorders, Dizziness, Seizure Disorders, Low energy, Depression, Ringing in the ears, Vision problems, Numbness, Heat or cold sensitivity, Chronic pain in the body, Temporal mandibular joint pain (TMJ), Poor immune system, General nervous tension, Poor digestion or elimination. What to be expected from a session? You remain fully clothed as you relax on a comfortable, padded table. The therapist begins by gently touching various parts of your body to monitor the rhythm of the fluid that is flowing around your central nervous system. She will trace those areas of weakness to the original source of dysfunction. Delicate manual techniques are then used to release those problem areas. Response to CST varies from individual to individual, and condition to condition. What you experience from your own session is highly individual, and can’t be compared to anyone else’s – even those cases that may appear to be similar to your own. The sessions are generally deeply relaxing, creating feelings of warmth or gentle pulsing in the areas the therapist is working on. Karen completed the Level 1 and Level 2 training of the CST eduction program at the Upledger Institute International and is a certified CST therapist. The Upledger Institute International is recognized worldwide for its groundbreaking continuing-education programs, clinical research and therapeutic services. The Institue was co-founded by the late Dr. John E. Upledger, who was recognized as an innovator and leading proponent in the investigation of new therapies. His development of CranioSacral Therapy in particular has earned him international acclaim. In addition, Karen is a certified Pilates and yoga instructor. From a corporate executive to a Pilates / yoga instructor to a CST practitioner, Karen hopes to help others awake their inner physician to achieve self recovery. She speaks English and Chinese.